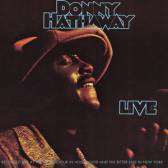 Donny Hathaway - Live 12"
Recorded live at the Troubadour in Hollywood. Recorded live at the Bitter End in New York. Bass solo during [B4] is taken from a performance recorded at the Troubadour in Hollywood. Phil Upchurch appears on this album through the courtesy of Blue Thumb Records. An Atlantic recording distributed by WEA Musik GmbH. Made in Germany. ℗ © 1973 Atlantic Recording Corp.
Embossed Warner logo on back cover. Essentially [url=https://www.discogs.com/Donny-Hathaway-Live/release/5613647]this same version[/url], but without barcodes and different runout info (same pressing plant). Probably released in the early 80s.